Well, that's not creep at all. 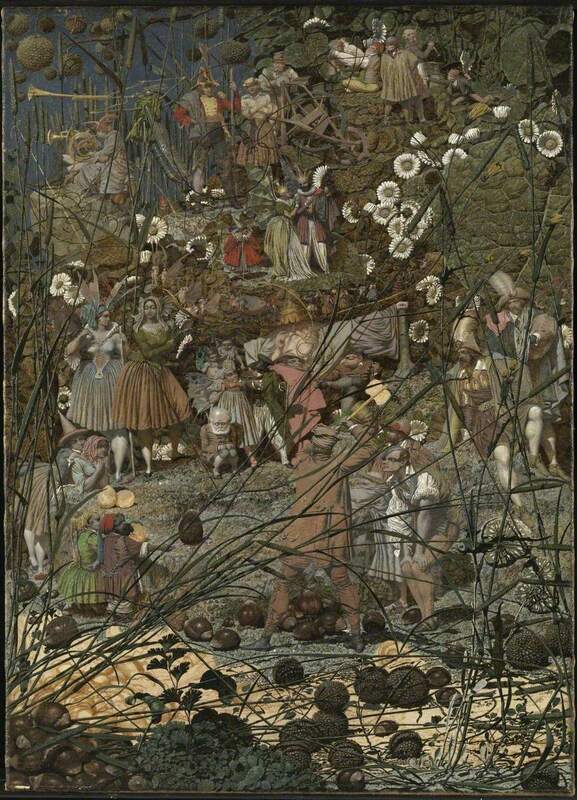 I knew we could rely on Richard Dadd to give us an unexpected Madonna and Child and he has come through with this contemporary mother and her spin-headed baby. 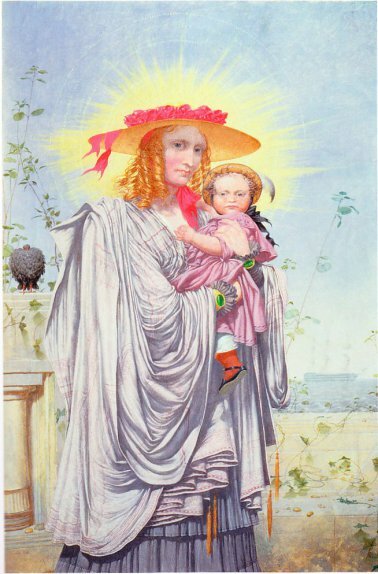 Her straw bonnet enhances the halo of light around her golden curls and her dress is Virgin Mary blue. The ribbons, roses and the baby's stockings bring in the hints of red, reference the blood and trials to come. What really gets me is the massive white cloak she is wearing. It's like an enormous shroud. Is it meant to be the dress and wings of an angel? It really is huge, making it almost look like some invisible person is hugging her from behind. The tassels look like gold dripping from the cloak, like little golden lights hovering in front of her. 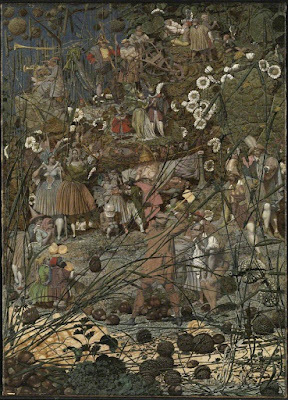 Now, we all know Richard Dadd (1817-1886). He's the chap who went to the Middle East and came back and killed his father who he believed was the devil. He then spent the rest of his life in either Bedlam (St Bethlehem's Hospital) or the newly-built Broadmoor. The majority of his art that we know is from his incarceration, and all of it is tinged with an otherness. 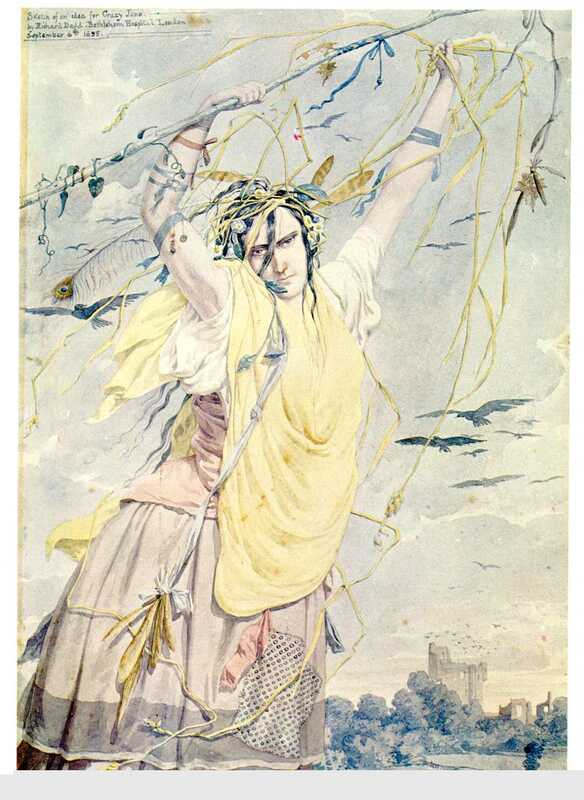 Dadd's mother died when he was just seven years old and you wonder if he had an idealized view of her. 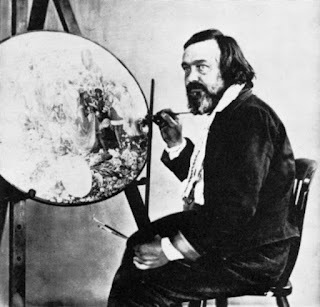 Not only that but his father remarried quite quickly after the death of his first wife and had two more children with wife number 2, who also died a few years later, leaving Richard Dadd bereft of two mothers before he was barely a teenager. So what to make of Dadd's Madonna and child? The mother seems a monumental figure, literally glowing with goodness, more than capable of holding the tiny child. For heaven sake, the sun is coming out of the top of her hat, you can't get much more holy than that. Just one question, what on earth is that on the wall behind them? Yes, that is the creepiest Madonna and Child I have ever seen. Yikes!